This example shows how to make diagrams that maintain themselves to make sure they are always up-to-date. The idea is that we want a diagram that shows all the relations of the owning object. The diagram should always be up-to-date without manual intervention. Note that we need to use model.toArrayList to convert the C# generic List<> that cannot be used by VBScript to an ArrayList that can be used. In the first part we use the magic EA-Matic keyword to in order to tell EA-Matic it should use this script. We also declare the important ID’s of the selected connector so we can compare that with the ID’s of this connector once it has changed. The first event we use is the EA_OnPostNewConnector. This event will be fired after you create a new connector in EA. In this event we add the newly related elements to each others auto-diagram, if any.
' This script, when used with EA-Matic will maintain auto-updating diagrams for elements.
' A nested diagram with prefix AUTO_ will be considered an auto-updating diagram.
' The diagram will keep track of all elements related to the owner of the auto diagram. The next part deals with the deletion of a connector. Each time a connector is about to be deleted EA fires the EA_OnPreDeleteConnector event. We remove the connected elements from their respective auto-diagrams, but only if this connector was the last connector between the two elements.
' Removes the related element from the auto update diagram if any. 'The project interface needs GUID's in XML format, so we need to convert first. Interesting work, Geert. You have explained the way the add-in is implemented. But can you clarify a bit more its use? 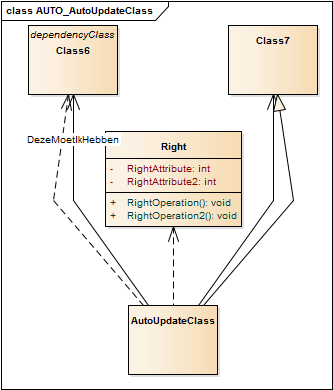 It is supposed that the architect write the first time the diagram, then someone changes the code related to that diagram, and the latter automatically update itself? Are different usage scenario possible? Yes indeed, you make the diagram once, and then it keeps itself updated with the changes in the model (only the model, not the code). The example uses all relations of class, but you could easily adapt the script to only show a specific type of relation, the owned classes of a package, or something else. At one of my clients we use to have this type of diagrams, and it was a constant worry to keep them up to date. What is the difference with the standard behavior of EA? I mean, in some case, also EA update a diagram (for example, if in another diagram you add a relation between two elements present in the first one. By the way, I am trying to use the Automation Interface to produce something similar, but from a different perspective. For me the code plays its role in the lifecycle. Some updates come from a reverse engineering of the source code. In this case, I am working on automatic layout algorithms to layout the diagrams according to some levelization techniques. What I am discovering is that the API is less power than I thought. It is a pity. Prbably I would work directly in the repository database… not the way I would like to program. The difference is that EA only adds relations to a diagram if both elements are present on the diagram. My script will add or remove elements in reaction to relations being added or deleted. Creating your own layout algorithm seems like a fun but complicated project. And indeed the API is just a very thin skin on top of the EA database. That is also the reason why I wrote the EA Addin Framework. It shields me from all the dirty database operations and provides a clean and functional interface to work with. I haven’t done much with diagrams yet, so that part hasn’t been fully developed yet. I didn’t know that you are the author of the EA Addin Framework. It is available also through the Sparx EA site, isn’t it? Is it free to use in our own projects? Is it also documented? I am not doing exactly what it offers, but it can be of some help to check its features. At the moment, I have developed a wrapper layer based on abstractions like ModelRepository, Graph, DependencyGraph, Node, and other useful abstractions such as Cycle, etc. useful for reasoning about the layout of diagrams. Of course, these Core abstractions decouples all the rest of my framework from the knowledge and the manipulation of EA objects. Nice to see different approaches. You might need to remove the references to LogicNP.CryptoLicensing from License before you can compile the project. There’s a fair amount of comments in the code, but for the moment there’s no other documentation then that.